What is a Listening Tour? When a state agency and its program officers from Austin take the time to travel to rural areas across South Texas and listen to locals, communities, employers, individuals and stakeholders, the agency benefits with greater understanding, deeper insights and more valuable perspectives about the people it serves. The Texas Workforce Commission (TWC) is more accessible than most people may realize. Through more than 200 Workforce Centers and satellite offices across the state of Texas, and 130 Vocational Rehabilitation field offices, TWC connects job seekers and employers with workforce development services and training — but TWC wanted to hear directly from multiple stakeholders: Local workforce boards, employers, economic development corporations, independent school districts superintendents, trainers, counselors, non-profits, chambers, elected officials and constituents. That’s why TWC Commissioner Representing Labor Julian Alvarez and TWC staff representing several TWC programs embarked on a South Texas listening tour, April 9-13, 2018. The group visited six specific Workforce Board regions: Lower Rio, South Texas, Cameron County, Coastal Bend, Alamo and Capital Area Workforce Development Areas taking along staff from TWC’s Skills Development Fund; Vocational Rehabilitation program; Apprenticeship program; and Adult Education and Literacy program. City stops included Brownsville, Laredo, Corpus Christi, San Diego, San Antonio/Hondo and Austin. Listen and learn from rural communities. Allow stakeholders to tell their stories, share their struggles and their successes. Build strong relationships with rural communities and determine how to work together as a team with workforce development and training services in mind. Educate on our workforce and training program staff, generate new interest from individuals we might not normally hear from, and bring better services. Exit with takeaways to use as next action items. Commissioner Alvarez explained that many Texans cannot afford to make it to Austin to discuss their workforce development experience and needs, and that others may simply be unaware of what TWC services are available. Which Programs Went on Tour? Photo: TWC Program Managers kicked off the Texas Two Step Boot Tour from Austin and headed to Brownsville for the first listening tour stop. 1. The Skills Development Fund is Texas’ premier job-training program providing local customized training opportunities for Texas businesses and workers to increase skill levels and wages of the Texas workforce. The Texas Workforce Commission administers funding for the program. Success is achieved through collaboration among businesses, public community and technical colleges, Workforce Development Boards and economic development partners. 2. Adult Education and Literacy providers are organizations with instructors delivering English language, math, reading, writing and workforce training instruction to help adult students acquire the skills needed to succeed in the workforce, earn a high school equivalency, and enter and succeed in college or workforce training. TWC contracts with a wide variety of organizations to provide AEL instruction and promote an increased opportunity for adult learners to transition to post-secondary education, training or employment. 3. The Vocational Rehabilitation program helps people with disabilities prepare for, find or retain employment and helps youth and students prepare for post-secondary opportunities. The program also helps businesses and employers recruit, retain and accommodate employees with disabilities. The program serves adults with disabilities; youth and students with disabilities and businesses and employers. 4. Apprenticeships combine paid on-the-job training under the supervision of experienced journey workers with related classroom instruction. Most registered apprenticeship training programs last from three to five years as determined by industry standards. The 2018 Texas Two Step Tour began with a stop in Brownsville, to visit with the Cameron County Workforce Board. A forum was held at the Texas Southmost College Performing Arts Center. While there were multiple questions asked at the Texas Southmost College, one major realization realized from the overall discussion is the severity of the skilled trades “skills gap” in the area and the need to continue the development of technical and skilled trades programs at both the high school and college levels to close those gaps as soon as possible. Photo: Attendees of the Labor Boot Tour learned about customized training through Skills Development and Apprenticeship. This conversation was followed by attendees of the Labor Boot Tour learning directly about customized training through our Skills Development and Apprenticeship teams discussing TWC programs. Photo: TWC Director of Employer Initiatives Aaron Demerson discusses the Skills Development Fund to stakeholders in Brownsville. Commissioner Alvarez noted that worker training is the key as the Rio Grande Valley transforms from an agricultural economy to an advance manufacturing, aerospace, maritime and LNG economy. Invited stakeholders included Career & Technical educators, college tech-ed officials, Economic Development Corporaitons, and the Port of Brownsville–all of whom gave brief presentations of what they are working on, and the need for continued TWC funding assistance to be successful–particularly increased JET funding for the next biennium. An overall realization demonstrated was the severity of the skilled trades “skills gap” in the area and the need to continue the development of technical and skilled trades programs at both the high school and college levels to close those gaps as soon as possible. In Mission, Texas, the Two Step Tour participants were hosted by Workforce Solutions-Lower Rio Grande, and began with an in-depth tour of Royal Technologies, an advanced engineering and manufacturing company that services diverse industries. Photo: Royal Technologies takes TWC Program Staff on a tour of their manufacturing facility. Photo: Tour of the Royal Technologies work space. Highlights of the tour included viewing how automation and robotics are used by companies such as Royal Technologies, to create labor costs efficiencies, and how a manufacturing company serves both automobile and technology markets in North America and Mexico. The tour was followed by a stakeholder meeting at South Texas College Technology Campus in McAllen, for the larger group Q&A discussion where Commissioner Alvarez, and TWC key staff from Austin, provided stakeholders pertinent information about programs and services available to the region. Photo: TWC Program Directors field questions from the listening forum attendees in Mission. TWC staff engaged in one-on-one discussions with stakeholders representing economic development corporations, business, education and community based organizations. Maximizing and leveraging partnerships and information to better serve individuals with disabilities. Development of innovative partnerships and programs through apprenticeship programs: TWC’s Desi Holmes answered various questions regarding apprenticeship programs and shared best practices (as seen across the state) in efforts to create programs that enables individuals to obtain workplace-relevant knowledge and skills. Overall, creating responsive programs to meet the needs of business. Photo: TWC Staff, Workforce Solutions – Lower Rio Grande Valley Staff, and area stakeholders join for a photo at the Mission listening forum. During the visit with Workforce Solutions of South Texas, the team visited Lyndon B. Johnson High School. Photo: Rogelio Trevino ED WFS South Texas takes TWC Program staffers on a tour of LBJ High School in Laredo, to see JET and Dual Credit funding at work. Photo: Students at LBJ High School work on life-sized computer simulated cadavers made possible through dual credit funding. The team then visited the University of Texas Health Science Center at San Antonio Regional Campus Laredo. Photo: Laredo Mayor Pete Saenz welcomes Commissioner Alvarez and TWC Program Directors to Laredo. Photo: Two Step Tour staff fielded questions from participants of the stakeholder listening forum. The team then visited Doctors Hospital of Laredo. Photo: The Boot Tour team visits Doctors Hospital in Laredo to see Skills Development dollars in action. Commissioner Alvarez and the Boot Tour team kicked-off day three at San Diego High School with Superintendent Dr. Samuel Bueno and Principal Claudette Garcia. Photo: San Diego Early College High School students show off their classroom hospital room lab stations to TWC staff. The group toured the Certified Nursing Assistant and Welding programs funded by the JET and Dual Credit grants provided by the Texas Workforce Commission. Photo: Welding students at San Diego High School talk about the benefits of their CTE education with TWC Commissioner Julian Alvarez. The Two Step Tour group then moved on to Corpus Christi to meet with staff at the Workforce Solutions – Coastal Bend, as well as area stakeholders. Superintendents of the Calallen and Flour Bluff Independent School Districts briefed the group on their Career and Technology Programs. Photo: TWC Commissioner Julian Alvarez returns to the classroom to chat with superintendents from Calallen and Flour Bluff Independent School Districts. Iain Vasey, president of the Corpus Christi Regional Economic Development Corporation, provided an overview of the Coastal Bend economy and $50 billion in current regional projects. Photo: Iain Vasey, president of the Corpus Christi Regional Economic Development Corporation, provided an overview of the Coastal Bend economy and $50 billion in current regional projects. The visit concluded with a tour of the Craft Training Center of the Coastal Bend. Photo: Dr. Mike Sandroussi gives a tour of the Craft Learning Center to Commissioner Alvarez and TWC Program Staff. Photo: Craft Learning Center partners with WFS Coastal Bend for Workforce Training. The Boot Tour team visited Workforce Solutions Alamo on day four and hosted a listening session and invitation for questions. 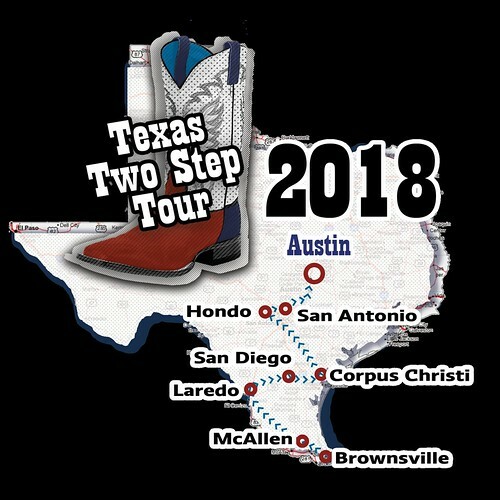 Photo: Workforce Solutions Alamo welcomes 2018 Texas Two Step Boot Tour. Dr. Bruce Leslie, Chancellor, Alamo Colleges – provided an overview of Alamo INSTITUTES which consist of six categories: Creative & Communication Arts; Business & Entrepreneurship; Health & Biosciences; Advanced Manufacturing & Logistics; Public Service; and Science & Technology. Pooja Tripathi, Project Coordinator – Workforce Services, Bexar County Economic Development Department and Mary Batch, Assistant Manager, Human Resource Development (HRD), Toyota Motor Manufacturing Texas, Inc. – provided an overview of TXFAME. David J. Zammiello, Executive Director Project Quest – provided an organizational overview. The mission of Project QUEST is to strengthen the economy by providing expert support and resources to develop a pipeline of highly qualified employees for in-demand occupations that offer a living wage, benefits and a career path. Ryan Lugalia-Hollan, Executive Director P16 Plus – Mission statement is to ensure that all young people in Bexar County are ready for the future. Programs designed to help youth understand and master the concepts and challenges of basic personal finance investments in programs to build a pipeline of STEM-capable students. Steve Hussain, Chief Mission Officer, Goodwill Industries of San Antonio – Good Careers Academy – Goodwill San Antonio’s goal is to provide an educated workforce empowered to reach their career and life goals and achieve self-sufficiency for themselves and their families. Particularly focus on empowering individuals who face barriers in gaining employment by providing education, training, career services and robust service coordination. Juan Antonio Flores, Executive Vice President, Governmental Relations, Port San Antonio –provided an overview. Home to over 70 tenant customers who directly employ about 12,000 fellow citizens. David Meadows, City of San Antonio Economic Development Department (EDD) – provided an overview. Development of Workforce Development Division. EDD has funded workforce agencies for many years but only started developing policy around workforce development over the last couple of years. The second portion of the tour took place at Accenture Federal Services (AFS). Ali Bokhari, AFS Delivery Network Director, Accenture Federal Services, provided an overview and tour of the facility. Romanita Mata-Barrera, SA Works, was able to join the group and partake in the discussion. Photo: Accenture Tour showcasing their varied services and jobs to the Texas Two Step Boot Tour. Vocational Rehabilitation – discussion regarding the partnership Accenture Federal Services has developed with Texas Workforce Commission Vocational Rehabilitation San Antonio location regarding the employment of people with disabilities. This is an ongoing partnership with not only TWC Vocational Rehabilitation staff but also WSA staff. On-the-Job-Training – discussion regarding how AFS and WSA are collaborating in providing OJT noting obstacles that have been encountered. Apprenticeship – AFS provided a review of their in-house apprenticeship program. Photo: Texas Two Step Tour members pose for a group photo inside the Accenture Federal Services headquarters in San Antonio. This portion of the tour brought the team back to the Board Office. Carolyn King, Director Grants and Clinical Education Operations, Methodist Healthcare System of San Antonio provided an overview of the various initiatives Methodist Healthcare System of San Antonio has utilized focusing on TWC grant funding. Mark Milton, Senior Director of Workforce Operations, Goodwill Industries of San Antonio – Good Careers Academy was also in attendance. Retention opportunities utilizing Goodwill, Project Quest as well as Alamo Colleges. Interview Skills, helping students determine the best fit. Interviewing with numerous departments at the same time. This has been successful for not only the students but the respective supervisors. Utilization of Skills Development Funds. Photo: Tour of the Goodwill Good Careers Academy in San Antonio. The final leg of the visit to San Antonio was a guided tour of the Goodwill – Good Careers Academy, located at 406 West Commerce St., San Antonio, 78207. Mark Milton, Senior Director of Workforce Operations, Goodwill Industries of San Antonio – Good Careers Academy provided the tour. Steve Hussain, Chief Mission Officer welcomed the team to Good Careers Academy. Some of the items highlighted were the classroom, as that particular Good Careers Academy hosts students from Fox Tech High School. This portion of the tour took place at South Texas Regional Training Center (STRTC) 402 Carter St., Hondo 78861 (Medina County). Photo: A view of the stakeholder listening forum in Hondo. Hondo Mayor James Danner, and Jesse M. Perez, of the City of Hondo, Economic Development Department, provided an overview of workforce initiatives in Hondo/Medina County. In 2013 the City of Hondo initiated discussions with Goodwill Good Careers Academy to bring CNA course and other technical courses to the STRTC. And agreement with Hondo High School and Goodwill was created to offer CNA to Hondo High School Seniors. In 2014 Concordia University began offering a Master’s Degree for teachers and BS Degree for Teachers’ Aides seeking to become teachers. Photo: Commissioner Julian Alvarez presents a TWC Challenge Coin to Hondo Director of Economic Development Jesse M. Perez. In 2016 the City of Hondo Economic Development Corporation (COHEDC) approved $285,000 to renovate 5,000 sq. ft. of vacant space into an allied health training suite and create two additional multi-purpose classrooms. In 2016, the City of Hondo and COHEDC submitted a request to the US Department of Commerce Economic Development Administration (EDA) for a $960,000 grant with a $240,000 local match to build an annex for vocational/technical courses. EDA approved the grant request and are in the process of making arrangements to build the annex. In January 2016 WSA leased space to provide workforce development services in Medina County at STRTC. In 2017, together with WSA and Southern Career Institute (SCI) CNA courses were offered to adults. SCI provides the instruction. WSA provides funding for qualified adults. Photo: A group photo from the stakeholder listening forum in Hondo. The Texas Two Step Boot Tour team met with Workforce Solutions of the Capital Area staff on day five. The team toured St. David’s North Austin Medical Center. Photo: Members of the Two Step Boot Tour visit a maternity delivery room at St. David’s North Austin Medical Center which features training tools to simulate a mother and newborn child. The team also toured the Austin Community College ACCelerator Laboratory. Photo: ACC ACCelerator displayed a greeting for the Texas Two Step Boot Tour team. Photo: ACC ACCelerator’s vast training and work space. The final day of the Boot Tour culminated in a listening session with Workforce Solutions Capital Area staff and local stakeholders. Photo: A view of the listening forum with Workforce Solutions Capital area staffers and stakeholders. “Those are good questions. TWC went on tour to listen and learn from rural communities. This was an opportunity to allow stakeholders to tell their stories, share their struggles and their successes. I think what really stood out about the tour for me is how much our services here at TWC have had such an impact on so many lives, communities and the economy. For example, I knew TWC makes a difference and that TWC-TWS workforce and development training programs and services have the ability to change lives, but it’s different seeing that in person. I knew our grants really trained people but it’s different seeing it up close and personal. That really hit home for me having had the opportunity to tour and witness first-hand a high school with 400 students on the receiving end of a JET grant. It was very powerful. And the students were equally as enthusiastic about sharing how it has changed their lives. These students are experiencing the newest and latest welding methods due to one grant with the end result being that industry are hiring many of them right out of high school. And that’s success, right there. That’s a significant takeaway. And sometimes the results speak for themselves. A secondary purpose for the tour was to build strong relationships with rural communities and determine how to work together going forward as a team with workforce development and training services in mind. On that note, I feel the tour was successful in that we successfully brought Austin to communities that can’t afford to travel to Austin to meet with our agency directly. Many who attended these stakeholder meetings and discussions were employees of non-profits while others ran agencies with limited resources. Finally, I’m glad to be part of such a great agency and work alongside individuals who truly care about what they do and the people they serve. Another purpose for the tour was for us to educate on our workforce and training programs, generate new interest from individuals we might not normally hear from, and bring better services. This tour allowed me a second opportunity to to experience how professional and knowledgeable our TWC staff actually are, how passionate they are about their programs and educating others, and how much they want to help others which is the essence of bringing better services. Photo: Each member of the Texas Two Step Boot Tour placed one of their shoes in the form of a circle to symbolize unity. Takeaway 1 – Target “Skills Gap”: The severity of the skilled trades “skills gap” demonstrates a strong need to continue the development of technical and skilled trades programs at both the high school and college levels to close gaps as soon as possible. Several communities spoke of the sense of urgency to continue building Career Technical Education (CTE) capacity in schools and colleges. TWC should also address how to help colleges work better with one another to build capacity and provide training for each other. Takeaway 3 – Expand VR Awareness: There is a need for greater discussion regarding the partnerships developed with Texas Workforce Commission Vocational Rehabilitation regarding the employment of people with disabilities. This is an ongoing partnership with not only TWC Vocational Rehabilitation staff but also WSA staff in certain regions. Maximizing and leveraging partnerships and information to better serve individuals with disabilities is essential. Takeaway 4 – Share Apprenticeship Best Practices: TWC heard of a greater need for development of innovative partnerships and programs through apprenticeship programs. There is a need for further discussion on shared best practices (as seen across the state) in efforts to create programs that enables individuals to obtain workplace-relevant knowledge and skills. Takeaway 5 – Be Responsive to Local Business Needs: TWC heard throughout the tour of the need to continuously create responsive programs to meet the needs of business areas visited – there is a realization that each region and city have their successes and their own needs. It is not a one-size-fits-all approach. TWC needs to take time to determine local needs. Takeaway 6 – Reduce Confusion Over VR Services: Because of the vast array of services offered by TWC (with each of these individual programs taken on tour), TWC is a full-service program for job seekers and employers. Certain questions asked to full audiences came from local Work Force Solutions staff wanting to understand the services provided by the boards and how to access them for VR customers. It demonstrates a need to educate at all levels on the full reach of TWC, boards, and their contractors. More education and awareness for VR programs is also needed. The other TWC programs are provided through grants to boards, schools, training centers etc. VR services are provided directly to the individual with a disability. There is sometimes confusion over how VR services differentiate from other TWC services. Takeaway 7 – Continue Visits with Local Stakeholders: Having traveled through six regions with TWC’s programs, TWC now has a better understanding that the true worth of the work TWC does and the programs managed that can only be fully appreciated when one is able to see the results and the impact our services our work has on the lives of people and businesses across the state. TWC program managers must engage in field trips in the future to better understand the impact of the programs TWC manages across the state. Takeaway 8 – Expand Outreach about Skills Development Fund: Each day of the tour TWC was asked about the Skills Fund Program. All areas and regions indicated a strong interest in the Skills Development Fund. TWC was able to discuss how it feels it has made a commitment to developing strong relationships at the local level by locating a Regional Staff person in the area. Unfortunately, TWC learned that many businesses and other partners often do not know that this person is there and that the person is a member of the state office team assigned to assist them in benefiting specifically from the programs and services TWC provides. Photo: A Boot Tour staff member’s “Texas is Wide Open for Business” boots. Public and community college libraries serve in a variety of capacities for Texas residents, providing community focused activities and conveniences for a diverse population. Many of these services lend support in locating beneficial information, resources and strengthening community networks. In an effort to reinforce neighborhood partnerships, Texas State Library and Archives Commission (TSLAC) has partnered with the Texas Workforce Commission (TWC) to expand library engagement with local Adult Education and Literacy (AEL) programs. TSLAC received a $200,000 grant to expand adult education opportunities to more than 4.3 million Texans who qualify for assistance. The Library AEL Expansion Project provides resources for libraries and literacy providers, including a digital literacy toolkit, a webpage containing best practices, and training workshops. One-on-one consulting will be available to strengthen and connect local adult education facilitators with materials; expanding the adult literacy programs connection with community resources. Additionally, the project creates opportunities for libraries and adult education providers to align efforts and build new partnerships to meet the needs of adult learners. With TWC’s AEL programs, adult learners receive English language, math, reading, and writing instruction to assist them in acquiring the skills needed to succeed in the workforce, earn a high school equivalency or enter college or career training. Individuals interested in TWC’s AEL program can visit the AEL Teachers and Providers webpage and Texas Adult Education and Literacy web pages. This 15-month project is part of the capacity building project initiatives set out in TWC’s Training, Resource and Innovation Network for Texas (TRAIN Tex) strategy to accelerate the advancement of education and training priorities, supporting successful education and workforce transitions for individuals, families and communities across the state of Texas. For more information on the Library AEL Expansion Project and other resources available for professional librarians and adult education providers, visit the TSLAC’s website.